Following on from Nintendo’s Wii U announcement, Death from Darksiders II makes an appearance at EB Expo 2012 as a playable title for the Wii U. Already available on PlayStation 3, Xbox 360 and Windows PC, Darksiders II has been a huge success for publisher THQ and developer Vigil Games. If you’ve played the game, the Wii U version is still worth checking out at the expo with Darksiders II utilising unique gameplay aspects specially tailored towards the Wii U. Features include use of the Wii U GamePad’s touch screen for map and objective display and management, as well as a visual look-up for quick access to abilities and Death’s inventory. If you’re thinking of purchasing the Nintendo Wii U, it may be worth holding out a little longer for Darksiders II on said console. Despite the later arrival, Darksiders II for the Wii U is the complete experience for Darksiders fans, and isn’t that worth waiting for? 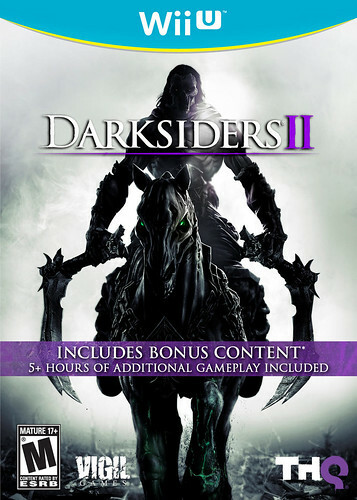 Darksiders II is a launch title for the Wii U. Learn more about Darksiders II in our Esperino review.